This is a humorously ironic song by Brooklyn based electro-dance rock rapper MESH. 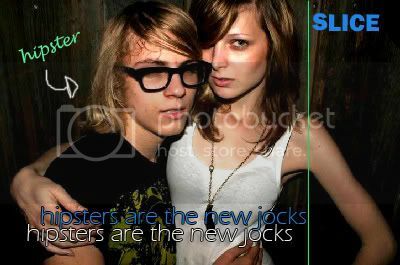 The track is called "Hipsters are the New Jocks"
ha ha... I'll have to check it out on my next visit to the NY. Thanks. She is bloody skinny eh? men I don't want to be rude, but who is that girl? jeez is so beauty, sorry bro but is the true, and that guy the look of one fusion between Kurt Cobain and Napoleon Dynamite, who the hell is he? Wow! Really Amazing here.... Very informative article when it comes in pin pointing the details. I will highly recommend this to all my friends. Thank you gus for this cognitive post.